Welcome to this week's Finance Fridays. Last week we were talking about the new rules surrounding watching the BBC iPlayer and having a TV Licence. This week we are looking at money and to be more precise the new £5 note that has been introduced this week. What's new about it? - Instead of being made of paper they are made of polymer plastic. They have been designed to be cleaner, safer and stronger. Although the notes aren't indestructible they should survive being sent through a cycle in the washing machine – that's if their slippery nature doesn't send it down the waster pipe. As they are stronger they are very hard to tear which means a note can remain in circulation for longer which will save printing and distribution costs plus also destruction of the old notes. As it is a new design they will no longer feature prison reformer Elizabeth Fry but instead it is Winston Churchill. The new note is also slightly smaller than the £5 note it replaces. How can I get hold of one? - They were launched on Tuesday but the first batch of notes were only delivered to certain ATMs in London, Manchester, Birmingham, Leeds, Hull and Cardiff. They should be available throughout the country from next week. Things to look out for - Brand new notes can have a tendency to stick together so make sure when you hand one over it is just one. Apparently once they have been used a bit they should be fine. The new security feature on it is a transparent window designed to make it harder to counterfeit. How long can I use the old £5 notes for? - The old style paper £5 featuring Elizabeth Fry on the back will be valid as legal tender until 5 May 2017. The Bank of England hope by then most of the old £5 notes should be out of circulation as they have printed 440 million of the new notes. So start checking old bags, purses and money boxes for any £5 notes that will need changing. After 5 May 2017 some high street banks may continue to swap the old notes for new notes otherwise you will need to exchange them at the Bank of England in London. What note is next for an upgrade? - The new £10 note featuring Jane Austen is due for release in Summer 2017. By 2020 the £20 note should have been replaced with JMW Turner on it. Also due for release next March is the new £1 coin. 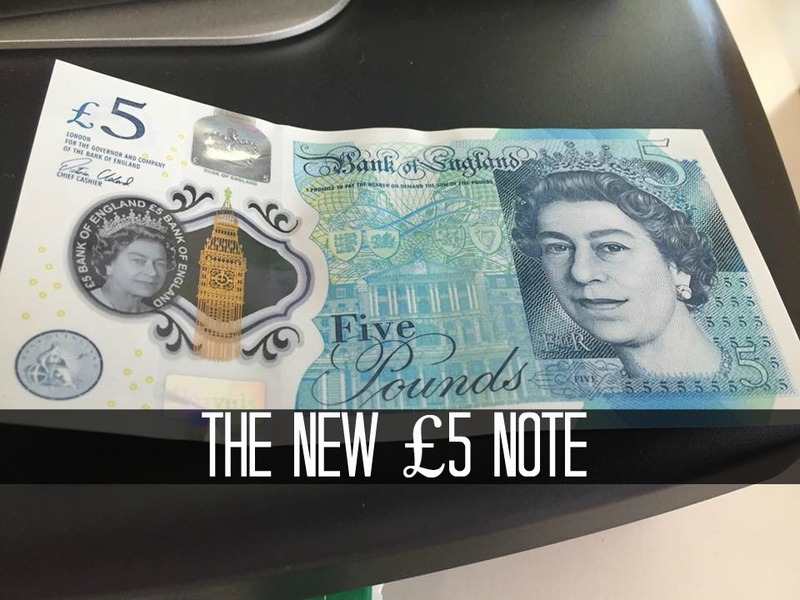 What do you think of the new £5 note? Have you used one yet? Many thanks to Andy from Be Clever With Your Cash for use of the new £5 note photograph. If you want to join in with this week's Finance Fridays then add your link to the linky below. Any post concerning financial matters is allowed. Full details here. It doesn't have to be published today as you have until 23.55 on Tuesday 20th September 2016 to join in. Oh interesting. I havent seen one yet, but my boys have been talking about them as they have discussed them at school. I haven't seen one yet, but interesting to see the new design. I'm as excited about getting my paws on one of these as my son is about the new FIFA game! Sad to see the end of Elizabeth Fry, but the new notes look cool. I need to get my hands on some!